A few weeks ago it was revealed that Kenya refused to sign a free trade agreement that China has been negotiating with the East African Community (EAC) since 2016. The core motivation for the rejection seems to be seated in intent to protect Kenya’s nascent manufacturing sector from being dominated by China’s massive and efficient manufacturing sector. This development highlights the concerns Kenya has with the balance of trade between the two countries. According to The East African newspaper, China accounts for less than 2 percent of Kenya’s exports yet 25 percent of Kenya’s import bill is from China. In 2017, Kenya exported goods worth USD 99.76 million to China but imported goods worth USD 3.37 billion resulting in trade deficit of USD 3.2 billion. Between January and May 2017 alone, Kenya was importing an average of goods worth USD 348.9 million from China per month. The trade deficit has made Kenya, and many other African countries in a similar position, very uncomfortable. Clearly, the trade deficit path is unwise and presents an additional financial problem the country has to address. There are also concerns by some that such massive trade deficits compromise Kenya’s ability to negotiate trade terms. 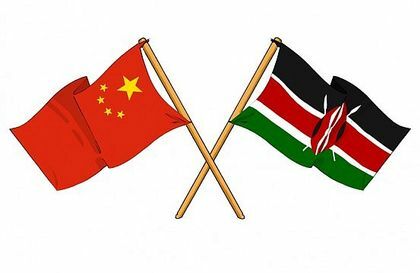 Sino-phobic narratives will argue that this is a deliberate effort by China to put countries such as Kenya in a position where they cannot protect the country’s interests in trade matters. However, it ought to be considered that the trade deficit exists between Kenya and China, not necessarily because China is pursuing this deliberately, but because China is better at producing what Kenya wants than Kenya is at producing what China wants. The trade deficit is arguably the result of market supply and demand dynamics. Top products imported from China include machinery, railway stock, iron and steel, vehicles and plastics; these compose more than 50 percent of imports from China. The truth is that Kenya largely doesn’t manufacture these and thus imports them from China. Sadly with China, Kenya is sticking to the usual yet unwise path of exporting raw materials and importing manufactured goods; a reality that reflects the weakness of manufacturing capacity in Kenya and Africa as a whole. And sadly, even in the export of raw produce such as fish where there is growing demand in China, Kenya is not exploiting the opportunity. Kenya fish output dropped by 10.2 percent in 2016, compromising the country’s ability to exploit demand for fish in China. The trade dynamics between Kenya and China accentuate the importance for Kenya to shift current behaviour to one that strengthens the country’s position. The first step is to enforce local content laws to limit the importation of goods in public projects and rather, procure goods manufactured locally. The good news is that there seems to be indication that for the next phase of the development of the Standard Gauge Railway, local purchases will not be lower than 40 percent of total procurement. These types of provisions are important because they provide a market for Kenyan manufactured goods thereby boosting manufacturing activity, but they also highlight the extent to which local manufacturers can (or cannot) meet large orders consistently which provides valuable lessons on what the country needs to do to improve industrial capacity. Secondly, Kenya needs to take advantage of the off-shoring of manufacturing capacity from China to other parts of the world. Partly informed by rising wages, China has been increasingly automating and off-shoring manufacturing; and Africa is benefitting from the latter to a certain extent. A report by McKinsey last year indicated that 31 percent of Chinese firms in Africa are in manufacturing and they already handle about 12 percent of industrial production in Africa with annual revenues of about USD 60 billion; revenues in manufacturing outstrip that of any other sector listed. If Chinese private sector are domesticating manufacturing capacity from China, then indigenous Kenyan firms can do the same. The constraints preventing this ought to be analysed and addressed. Thirdly, Kenya needs to develop a trade strategy for China. The government needs to audit products with growing Chinese demand and seek to build Kenyan capacity to better exploit market opportunities presented by China. Kenyan producers ought to better leverage opportunities such as the China International Import Expo and work with the Chinese Embassy to exploit opportunities and tap into supplying the domestic market in China, thereby increasing the country’s exports to China. Finally, Kenya should focus on revenue streams coming from China and strengthen these. Tourism is a massive opportunity for Kenya; hotel bed-nights of Chinese tourists to Kenya have increased 45.8 percent in 2017 compared to 2016, preceded only by Germany, UK, and USA. Government and private sector can be more deliberate in better understanding the needs of Chinese tourists and more aggressively market Kenya as a tourist destination in China. In short, given Kenya’s concerns with the growing trade deficit to China, the government and private sector ought to become more proactive in meeting market demand in China. The concern should provide impetus for the country to do the hard work of building manufacturing capacity as well as better understanding the Chinese market and leveraging diplomatic and private sector ties to achieve clearly defined trade strategies and goals. This entry was posted in Africa, Development economics, Economics, Kenya, Political Economy and tagged China, Trade.